Using a CRM strategy in your company should incorporate the logic of a business with a focus on the customer in its various areas such as: marketing, sales and customer service, for example. It seems a simple task, but it involves systems engineering for the necessary mapping that results in an effectively functional and useful tool. 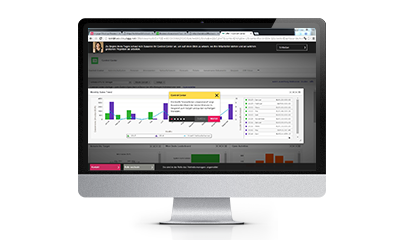 Manage contacts and record all interactions with your customers, potential customers. Efficient tracks all activities, recording all incidents, queries, complaints, ensuring that all are managed properly, leaving nothing unresolved. Improve productivity while increasing customer satisfaction. Plan, execute, and evaluate your Campaign investment from start to finish easily. Correct messages to your target and so you will get each recipient receive the right message at the exact time. Extend the relationship with your Clients and potential customers to social networks through social CRM and interact with them in a collaborative way. Track sales opportunities anywhere and in real time. The global view of the pipeline will allow you to select the most profitable and the most likely to be closed. Its sales team will focus on attracting new Customers and dealing with up-sell and cross-sell opportunities, achieving business success. Whatever the size of your business, Sage can help meet your sales, marketing and service needs. Take our guided tour today and see how Sage customers around the world are experiencing incremental revenue growth. Explore the product and navigate throughout the tour at your own pace. Alternatively you can go straight into the test drive. 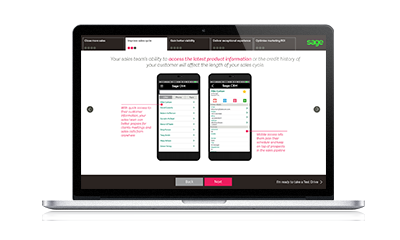 "Sage CRM met all of our specifications and achieved exactly the results we wanted. We wanted to give our team an easy-to-use solution that would save time by profiling, finding and contacting customers through fast data retrieval, and enabling more direct contact than was previously possible".